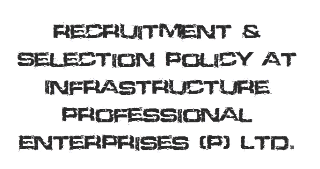 Home Internship Report MBA MBA Dissertation PROJECT REPORT Summer Training Recruitment & Selection Policy at Infrastructure Professional Enterprises (P) Ltd. 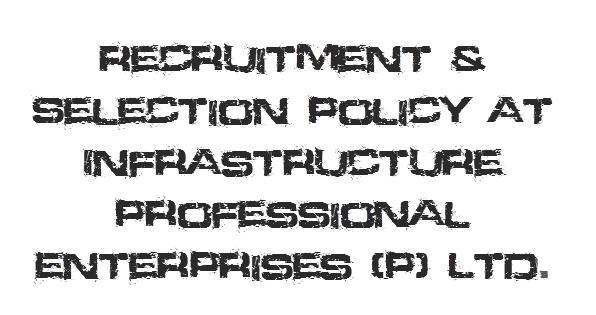 Recruitment & Selection Policy at Infrastructure Professional Enterprises (P) Ltd. This is a MBA summer training report on "recruitment and selection policy at infrastructure professional enterprises". The report starts with a general introduction “IPE GLOBAL” As well as its history, mission and vision. Then this report proceeds onto the preliminary talk about the organization. IPE has well defined sectors and practices based on which it is able to provide the right mix of skills, experience and tools to help partner agencies and governments. The objectives of Human Resource Department are Human Resource Planning, Recruitment and Selection, Training and Development, Career planning, Transfer and Promotion, Risk Management, Performance Appraisal and so on. Each objective needs special attention and proper planning and implementation. You can also always subscribe to newsletter for free to get free project on your mail. Objective of this study are to know overall about the company of IPE GLOBAL and also know each and every parts of the recruitment and selection process of that organization, to focus on major elements of Recruitment and Selection process, to focus on the process of Recruiting and selecting personals, to focus on the updates and the batter methods of modern technique etc. Recruitment means to estimate the available vacancies and to make suitable arrangements for their selection and appointment. Recruitment is understood as the process of searching for and obtaining applicants for the jobs, from among whom the right people can be selected.